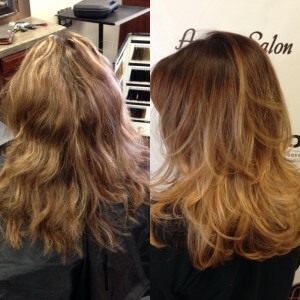 At Aurelio Salon in Howell and Toms River NJ, a client came in and wanted a Rooty Ombre. She was a level 6 with level 7 and 8 highlights but her natural base level is a 5. Beside the rooty ombre, a level 8 & 9, look she wanted a minimal upkeep. Her stylist started by going in as if it were a regular retouch but dramatically fanning it down into her midshaft. When completed, he took a wide tooth comb and brush through the hair to ensure everything will blend smoothly. the next challenge is to weave out the hair you want lightened. Using a board, the back of your hand works as well, he painted lightener onto the hair using a V technique. He then used his leftover root touch and feathered it into the lightener to avoid any harsh lines. Once his client had finished processing, he shampooed his guest with goldwell color fade stop shampoo. He then toned his client with 2 separate formulas. One on the midshaft and a second on the ends for a smooth gradient look! Have you seen any new make-up looks you’d like to try for spring? 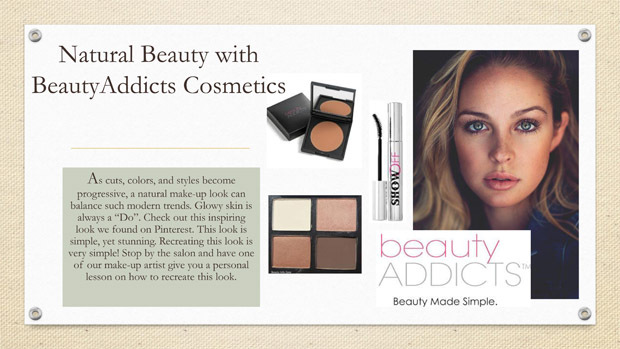 Check out Beauty Addicts Cosmetics line “Motivate” to inspire your spring 2015 make-up trends. Spring calls for color, and “Motivate” sets you up for flawless spring looks. This line consists of light pink and plum tones. These looks give off a flirty, fun vibe that is perfect for breaking out of the winter season! For your skin, you want to remain light. Use mineral tint as a base for our skin, along with Double Deception concealer. Use Pressed Powder to lightly buff into skin to create a natural, matte finish. Use motivate blush to make cheeks pop and contour cheek bones. Use Motivate eye shadow quads on eyes with motivate eye liner and ShowOff mascara. You can use the plum colors to create a more dramatic or edgier look. Use the lighter pink tones to create the sweet and flirty look. Call Aurelio Salon in Howell at 732-303-0052 or 732-551-2930 in Toms River New Jersey for more information about the beauty addicts spring makeup look. When you have a long bob (a.k.a “lob”) it can be difficult to style your hair with the perfect amount of volume and texture. If you have a one-length lob, meaning you have no layers, your curls tend to fall and curl only at the ends. While this may work for some, others can’t figure out how to create the perfect, textured “lob”. Follow these style tips with the following style equations. Style: First use the Body Build Detangler from AddVolume to damp hair. This will detangle your strands while providing light condition so your hair remains light and lifted. Following that use AddVolume Root and Body Lift at the roots for added volume and grit. A little FreeShape Hot Flex Spray along your mid-shaft to ends will give you added heat protection and slight hold to the hair so you can start creating the basic shape of your hair with a round brush. Finally, HairPlay Dry Wax will give you a matte finish with flexible hold. Style with a blow dryer and round brush. Finish: This style equation is the most important part of your look. The other style equations work as a base to prep your hair, but this is where the real styling begins. Spray hair with FreeShape 2+1 Styling and Finishing Spray. Use a 1” curling wand and wrap hair around certain pieces. You’re not looking to go for a perfectly polished look. You are going for texture. Once you curl your hair and get a lot of volume, spray HairPlay Playable Texture and lightly scrunch into hair to activate the product. Most of your texture will come from this product. Once you reach your desired look, use HairStay Medium Hold Hairspray to keep your style for 24hrs. Through-out the day you can scrunch your hair to reactivate playable texture! 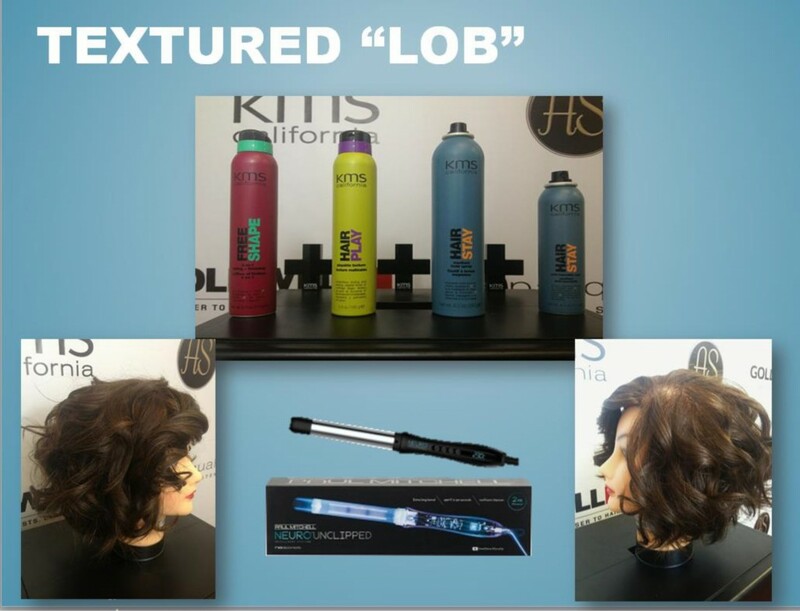 Call Aurelio Salon in Howell at 732-303-0052 or 732-551-2930 in Toms River New Jersey for more information about the textured lob or long hair bob. Hair Color Q and A! Q: What are the best shampoos to use maintain hair color; specifically blonde hair? A: After color services use a shampoo designed to prevent color fade. Color safe shampoos and conditioners have ingredients that prevent color from fading and some even enhance color in between visits. Blonde hair needs special attention and usually has its own line of color protection with violet tones to help preserve the color. When choosing a shampoo for blonde hair, it’s important that they’re moisturizing or repairing as well, since lightened hair is more fragile. Goldwell Blonde and Highlights shampoo and conditioner are an excellent choice to keep your hair healthy and shiny as well as the perfect tone. Q: Why does my blonde hair turn yellow/gold in between visits? Is the anything to prevent this? A: Blonde hair can turn gold/ yellow after services for many reasons, but the good news is it can be avoided. While at the salon stylists often tone your hair using a depositing color to counteract underlying pigments in the hair. When your hair is lightened, orange and yellow tones are naturally exposed. A violet or blue based color will cancel unwanted tones to give you your desired results. Demi permanent colors only stay in the hair for up to six weeks. When the color fades brass can become noticeable. Hard water at home, chlorine, sun, and free radicals also contribute to yellow tones. To keep you hair that perfect blonde, visit your stylist every four to six weeks for a toner or glaze. In between visits Goldwell Soft color is a temporary rinse that tones hair at home and can last up to eight shampoos. 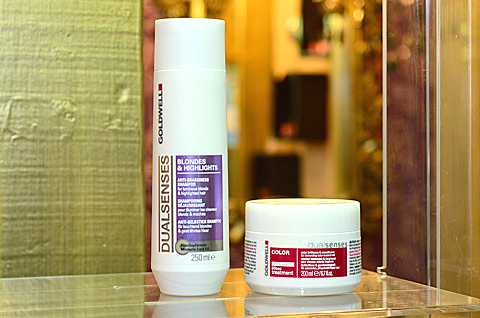 Wash hair with proper shampoo and conditioner such as Goldwell’s Blonde and Highlights line. The purple conditioner can act as a toner when left on hair for a longer time. Regular maintenance is needed for blonde hair, by using these tips your blonde will look beautiful between visits. Q: What are the benefits to professional hair coloring opposed to a seven dollar box of hair dye? A: Stylists are trained and certified to perform chemical services, with years of education and experience they have the expertise to not only customize your color but to determine the best look for you. Stylists are keeping you in mind during your service and want your hair to stay healthy. Box color may be cheap but so is the quality. Box color is designed to work on everyone therefore a high level peroxide solution is used. This not only damages the hair but can create hot roots and uneven color depending on your hair’s condition. Box color is often misused for touchups and is applied to the whole head causing further damage. The cost of box color may be less than a visit to your stylist, but the knowledge your stylist has is beneficial when taking into consideration your hair’s condition, texture, and the best way to achieve your desired result. Call Aurelio Salon in Howell at 732-303-0052 or 732-551-2930 in Toms River New Jersey for more information about the the Q and A. Beauty Addicts has recently embraced a new look for the spring! This look embodies the classic vintage look incorporated with the vibes of bohemian lifestyles. You can achieve this look by taking the classic vintage cat eye and red lip, and using a creative twist to uniquely transform into your own signature style. 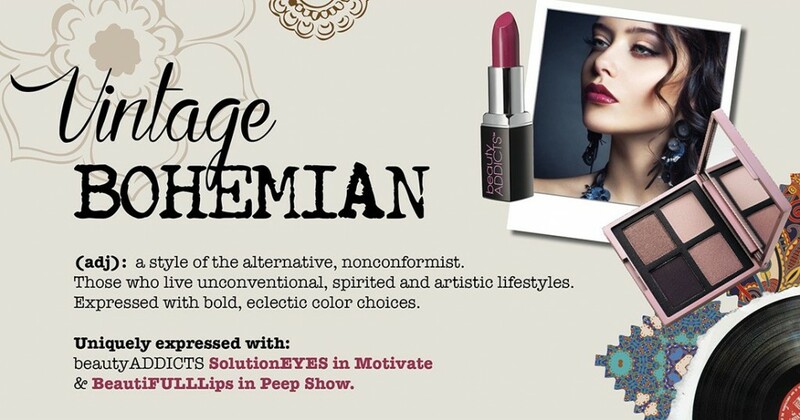 This look is embraced with Beauty Addicts Solution Eyes quad in Motivate and Beautiful Lips in the color Peep Show. Give this awesome new look a try this spring and show us by hash tagging #ASVintageBohemian on Instagram or Facebook! Call Aurelio Salon in Howell at 732-303-0052 or 732-551-2930 in Toms River New Jersey for more information about the vintage bohemian makeup look we offer to customers. 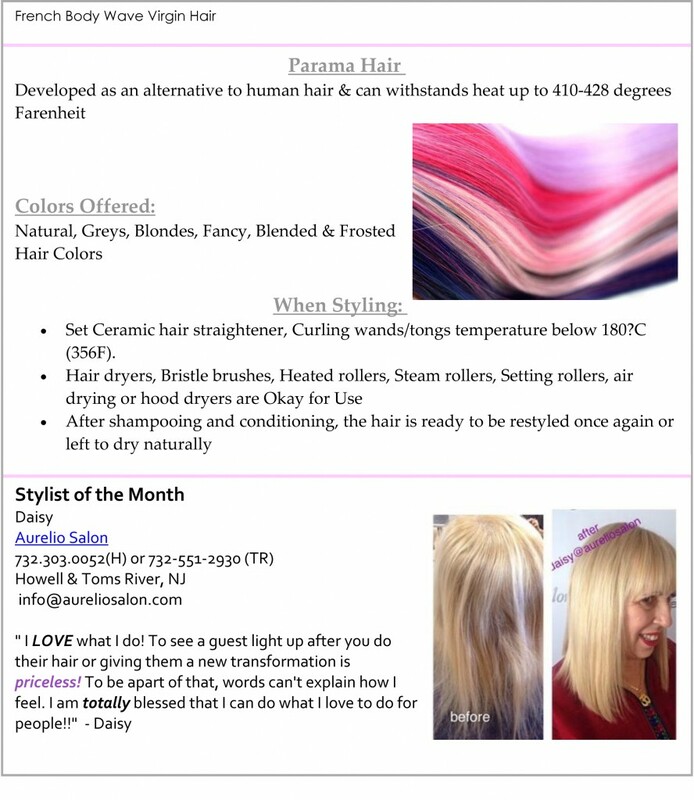 Congratulation to our Senior Director Daisy for being named Perfectress Stylist of the Month. In last months Email blast they announced this. Below is a copy of the email. Perfectress is Home of the world’s most luxurious hair extensions. It is their hope that as you wear the PerfecTress® brand Hair Extensions you will be transformed into the woman you desire to be. They exclusively distribute the PerfecTress Transformation Connections and Tape Weft Hair Extensions in the U.S. to Professionals only. Transformation Connections are reusable up to 3 times after the first application making the system less wasteful. You can wear them for a year if they are refitted every 12 weeks or 3 months. When Transformation Connections are removed with the Transformer they are instantly ready to be reapplied. As for the Tape Weft Hair Extensions you can use two Single Tape Wefts together with a small amount of natural hair in between it attaches solidly to the natural hair, to create volume, length and or highlights that can lasts up to 8 weeks and can be re-used. A full service takes no longer than 45 minutes! It is easy to apply, comfortable to wear and reusable. Suitable for fine and thin hair. Call Aurelio Salon in Howell at 732-303-0052 or 732-551-2930 in Toms River New Jersey for more information about Daisy being named stylist of the month. With spring weather just around the corner, we know that rain comes before the flowers. How are you going to protect your style against the moisture in the air? 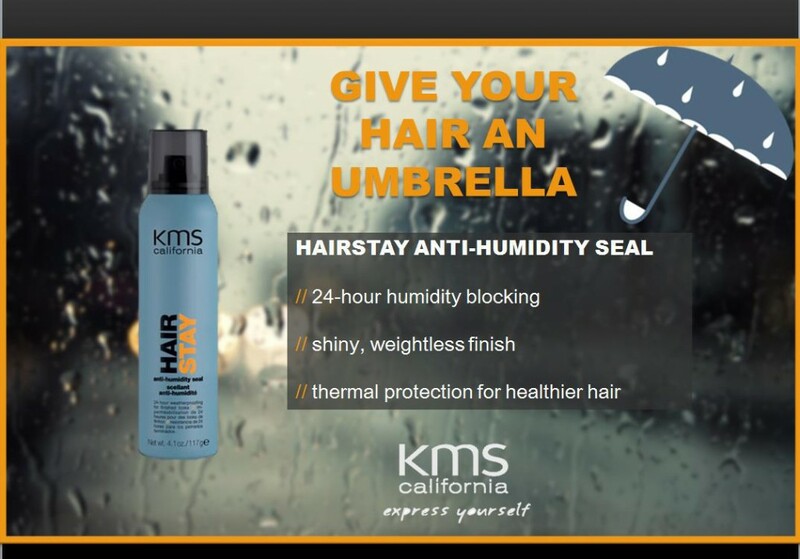 Anti-humidity seal provides 24 hour protection against humidity and also a shiny, weightless finish. When heat styling, it gives thermal protection for healthier hair, not to mention the amazing fragrance that lasts all day. Use as a finishing spray after blow dry styling or thermal styling with any tools. 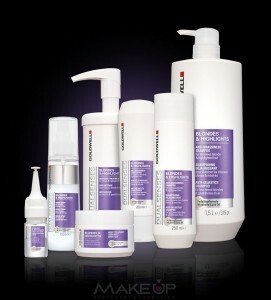 Stop in the salon and check out this awesome product and ask our stylists how it can work best for you! Last year, musical festivals brought in the opportunity to make style statements. Bohemian/ Hippie trends quickly set fire from these festivals. As the festival season is quickly approaching, we put together some “must-try” looks to get you inspired to try something new! First, we loved the “Boho Pony”! 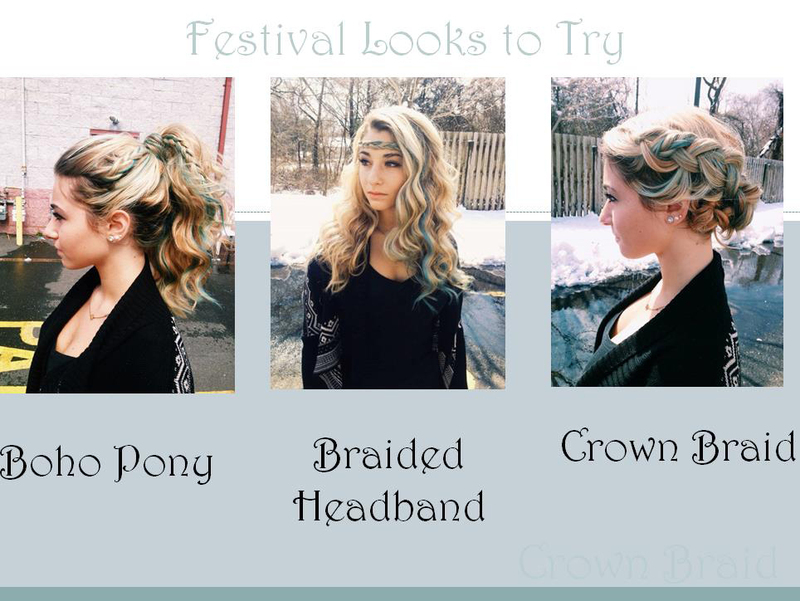 Whether it’s straight or wavy, the textured pony tail is a MUST for festival style. This look will keep you cooled and fashionable while jamming out to some EDM. Second, use your lengthy hair to create a fun braid. You can wear one big fishtail braid, or use a small braid to wrap around like a headband. Using a braid is quick and stylish. Lastly, the crown braid makes for a trendy way to keep your hair off your neck. Do two Dutch braids on each side and wrap them along the crown of your head. To make these styles more interesting, add some fun color and dance the night away! 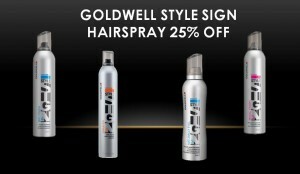 For this month only, Goldwell Style Sign hairsprays are 25% off!! Each hairspray is designed for pristine individual style, and helps give the best finish to your specific look. Ask any of our stylists which spray is best for you and how to use it! Offer is limited time only. Call Aurelio Salon in Howell at 732-303-0052 or 732-551-2930 in Toms River New Jersey for more information about April showers and the spring trends. 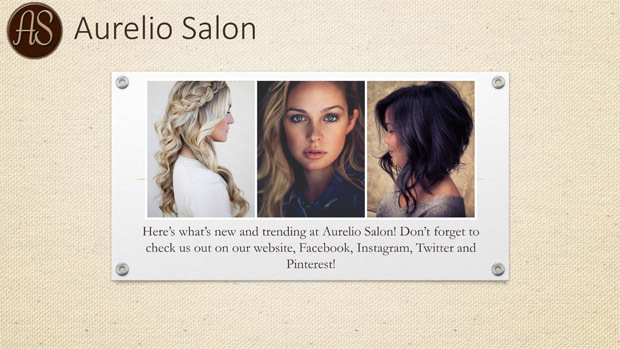 Here’s what’s new and trending at Aurelio Salon! Don’t forget to check us out on our website, Facebook, Instagram, Twitter and Pinterest! What’s still trending in 2015 is the “Lob”. 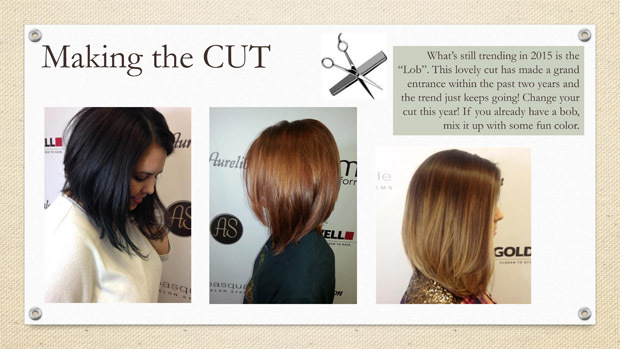 This lovely cut has made a grand entrance within the past two years and the trend just keeps going! Change your cut this year! If you already have a bob, mix it up with some fun color. As cuts, colors, and styles become progressive, a natural make-up look can balance such modern trends. Glowy skin is always a “Do”. Check out this inspiring look we found on Pinterest. This look is simple, yet stunning. Recreating this look is very simple! Stop by the salon and have one of our make-up artist give you a personal lesson on how to recreate this look. It’s that time of year! In just a few weeks, we will all be making plans for February 14th. Yes, Valentines Day. Whether you’re going out with friends to celebrate your freedom, or joining your loved one for a romantic evening, your night will consist of a fun creative style! These photos inspired us from Hair by Steph’s website! 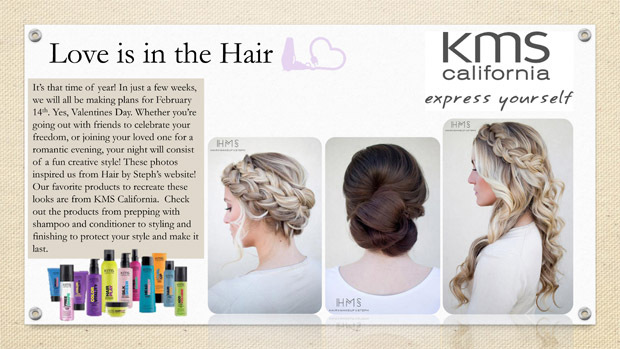 Our favorite products to recreate these looks are from KMS California. Check out the products from prepping with shampoo and conditioner to styling and finishing to protect your style and make it last. Call our salon in Howell at 732-303-0052 or 732-551-2930 in Toms River New Jersey for more information about what is trending at Aurelio Salon. Don’t get caught not looking your best due to a busy schedule! Here’s our Pinterest pick for a quick updo! We also accompanied this look with some KMS California hair products to make your style extra efficient while you are on the go! Check our FreeShape 2+1 styling and finishing spray, HairStay anti-humidity seal, and HairStay medium hold hairspray to enhance the style. These products will give you control of your hair, shine, and hold for an evening of parties! Co-washing has been a method of cleansing the hair with a conditioning cleanser. Originally used by women of color with unruly curls and coarse hair texture. The method has transformed over time and is used on men, women, and children with all hair textures. The increase in popularity of conditioner cleansing inspired Unwash to release a line of cleansers suitable for everyone. Unwash is the latest and greatest when it comes to co-wash.
Why use Unwash rather than shampoo? Unwash is a gentler, intelligent approach to cleansing the hair. Shampoos have stripping ingredients that take away natural healthy oils. 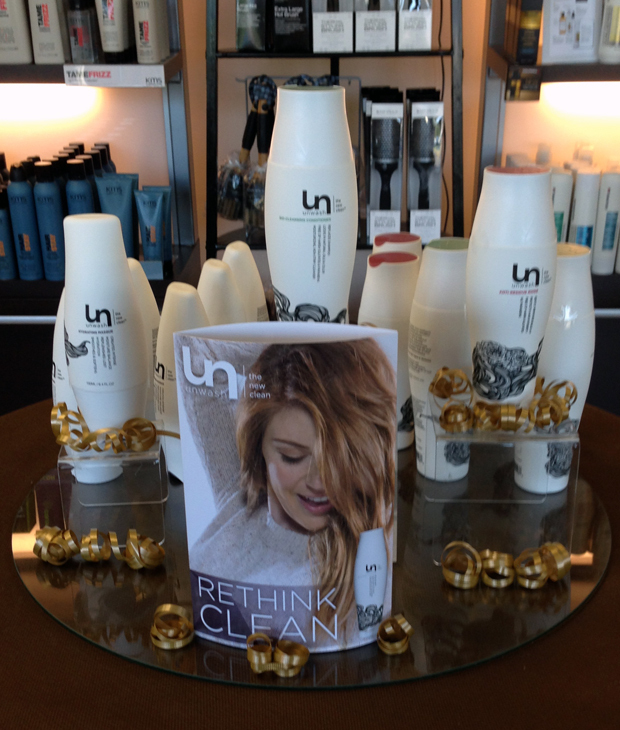 Unwash is sulfate free, paraben free, is vegan and contains nourishing ingredients. The use of unwash actually improves the quality of your hair after one use. The specialized formula removes dirt without drying out the hair and scalp. Over time unwash balances the hairs moisture rather than stripping essential nutrients. How do I use unwash? Cleansing with unwash is easy and only one step. Unlike most shampoos, the unwash bio cleanser can be used daily. The formula does not lather but emulsifies once in contact with water. Begin by using a small amount of cleanser and massage the scalp to remove dirt and unwanted oil, comb the rest to the ends and rinse. The Bio-cleanser is gentle enough to use daily. Unwash has an anti-residue cleanser that can occasionally be used to remove buildup from products, well water, or anything unessential to hair. Use the anti-residue cleanser when necessary to remove buildup and use the hydrating mask after to replenish moisture. What if I have any skin conditions such as psoriasis or dry scalp? The Unwash Bio-Cleanser and Hydrating Mask have an ingredient used by early Native Americans known for its healing properties. Seabuckthorn has been known to heal wounds and repair the skin. Unlike most co-washing cleansers, Unwash is actually recommended for such skin conditions. Because of the healing and moisture balancing qualities, Unwash leaves the scalp calm and soothed. Is unwash ok for colored hair? If you’re tired of seeing your color fade from harsh shampoos try using unwash and see the difference immediately. Not only does unwash preserve your hair color longer, it seals the cuticle to intensify color and shine. Why should I try unwash today? After one use of unwash you will see and feel the difference immediately. Drying time is reduced, hair color is enhanced, texture is smooth and silky, and over time you hair will thank you. Unwash is perfect for everyone, try it out today! Call Aurelio Salon in Howell at 732-303-0052 or 732-551-2930 in Toms River New Jersey for more information about co-washing with Unwash.